Jimbo Fisher, seen here celebrating FSU's win against Clemson on Oct. 19, signed a contract extension with the Seminoles. 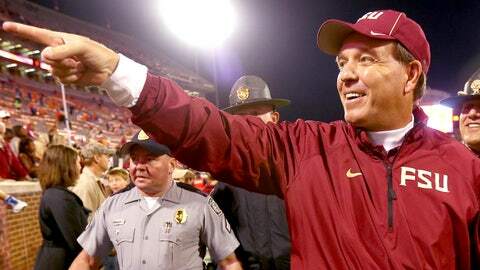 TALLAHASSEE, Fla. — Jimbo Fisher has signed an extension with Florida State just a week before the No. 1 Seminoles play Auburn in the BCS championship game. Fisher agreed to terms of a deal in early December with Florida State but the contract had not been signed. The deal, which runs through the 2018 season, was signed before the team departed for Pasadena, Calif., on Tuesday morning. A source told FOX Sports Florida that the deal is worth $4.1 million and is loaded with incentives. The source also said part of the deal includes raises for Florida State’s assistants. School officials said that Fisher’s contract would be released later this week. "I’m very happy to be there, they’re very happy to have me," Fisher said. "Hopefully that relationship can go on for a long time. We’ve had a great year. I love working there, I love being there and very comfortable there." Fisher, 48, had been linked to the opening at Texas, but it now appears that he will remain in Tallahassee for the long haul — and try to keep his staff together for the 2014 season. His current deal is worth $2.7 million annually, and he has already triggered incentives for winning the ACC and playing in a national championship game. In his fourth year as Florida State’s head coach, Fisher is 44-10. He has guided the Seminoles to back-to-back Atlantic Coast Conference titles, and Florida State (13-0) is playing for the program’s third national title when the team plays No. 2 Auburn (12-1) on Jan. 6.